In 1893, the year in which Bourdelle began working in the studio of Rodin, he received from his native town of Montauban one of the major commissions of his professional career—a monument commemorating the victims of the Franco-Prussian War of 1870-1871, on which he was to work over a period of almost ten years. The completed monument, installed in 1902 and comprising four warriors, was preceded by fifty-two preparatory, mostly large-scale sculptures, among them the one on view in the Museum's Billy Rose Art Garden, representing one of the figures in the final version: a massive warrior brandishing his sword in a highly expressive manner. Following the monument's inauguration, Bourdelle was criticized for, among other things, an alleged weakness in the figure's anatomic features. But Rodin, who had known similar complaints in the past, came to his pupil's defense, lauding the sculpture's freshness, spontaneity, and powerful expression. Rodin's artistic patronage is clearly evident not only in his praise of the finished monument but also in the molding of the figures of all the preparatory works. 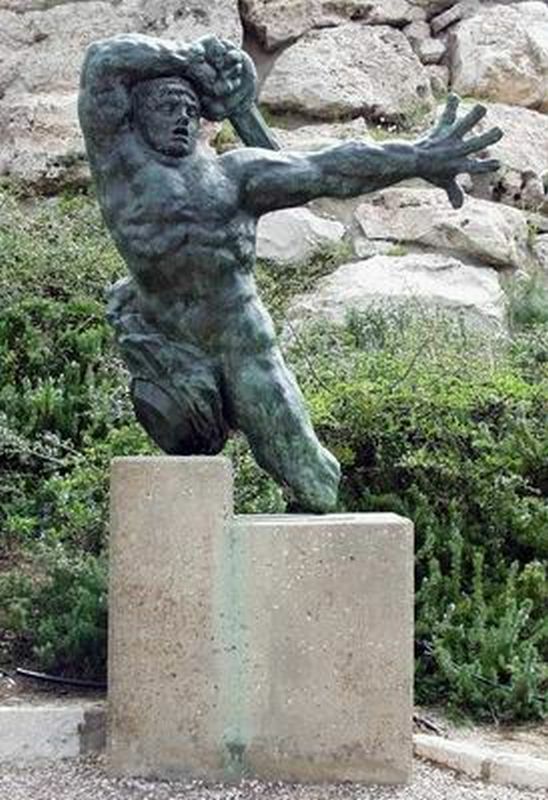 The intense expression, dynamic movement, and romantic rendering of injured and broken bodies, as well as the absence of a base, are all clearly influenced by Rodin's work at the turn of the nineteenth century, while differing from the more mellow style evolved by Bourdelle in the years to come. The warrior's right arm is raised above his head in a gesture recalling several of Michelangelo's slaves, but in contrast to their languid passivity he clasps a huge sword, his mouth opened wide in a scream, his eyes dilated with the effort, and his body turning dramatically toward the spectator. The figure is the epitome of bravery and fortitude in the face of death, all the more striking when compared with such famous Romantic representations of similar motifs as Théodore Géricault's Injured Warrior (1814) or the traumatized warriors in Francesco Goya's etching series, The Disasters of War (1810-1814). The heroic stance notwithstanding, the figure is mortally wounded—the left leg is cut off above the foot and looks like a clean stump, whereas the right leg is roughly severed from the knee, in stark contrast to the sturdiness of the outstretched left arm. This dual truncation turns the scene into a heroic moment—a last desperate attempt to fight back before being overtaken by death, the only foe capable of vanquishing the intrepid warrior. The tension between heroism and death, victory and defeat reflects the quest of contemporary France to represent the humiliating defeat of 1870 as a supremely valiant battle.| |The warrior is presented from the front and in the finished monument can indeed be seen only from this angle, since the other figures are grouped behind his body, yet a view from the rear adds an intriguing dimension and heightens the sense of impeding death. In addition to clues at the back of the work revealing the technique in which it was cast—cire perdue (lost wax), creating a hollow sculpture—the warrior's sword, though appearing intact when seen from the front, is in fact a mere fragment. The broken weapon and the amputated lower limbs spell destruction, horror, and pain—a far cry from the elegant torso effect created by cutting off the arms, for example, in Maillol's Harmony. The green patina of the bronze, while integrating the figure into its surroundings, heightens the poignant tension between the transient and the eternal conveyed by the valiant warrior gasping in the moment of death. The dramatic sculpture, juxtaposing strength and vulnerability, wholeness and impairment, life and death, conveys the Symbolist preoccupation with the cycle of life—yet another Rodinesque influence absorbed by the young Bourdelle.